No one knows the inner workings of a school better than the teachers themselves. It’s the teachers who see what works and what doesn’t working in their classrooms, day in day out. It’s the teachers that know what resources are invaluable, and which get left gathering dust or taking up space on their hard drives. That’s why at our Roadshow events touring schools across the country this Spring, we’re asking YOU to set the agenda. We’re travelling across England, ready and armed to help schools tackle the real issues facing them. With expert educationalist Mick Walker leading the seminars, he’ll ask you where your school is facing challenges, and tailor his seminar to suit your schools specific needs. During the workshops, you’ll have the opportunity to network with the teachers from your community, discussing how your unique challenges can be overcome, helping improve processes, and save your schools money along the way. There are limited spaces available at these events, which is why you need to register your interest now to be sure we’ve saved a spot for you! Remember, these events are completely free - but your school stands to benefit from savings that could be in the thousands of pounds. 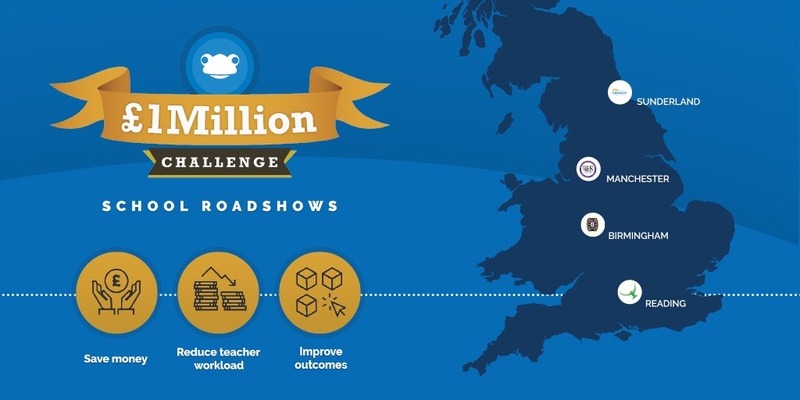 To find out more about the £1Million Challenge Roadshow and to save your spot, click here.